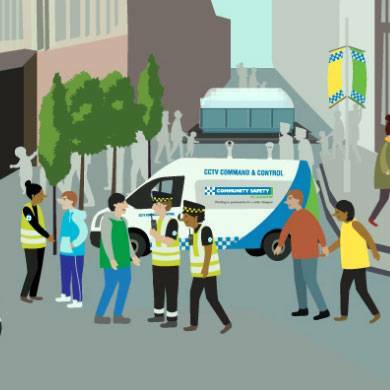 The City Centre Response Team is a specialist team of Community Safety Glasgow (CSG) Community Enforcement Officers, who primarily patrol the retail zone known as the ‘Golden Z’ (Sauchiehall St, Buchanan St and Argyle St and the surrounding streets and lanes. They patrol seven days a week between 9am and 7pm. As well as covering the Golden Z, they also patrol the International Financial Services District (IFSD) and Clyde Walkway, the Sauchiehall Street Business Improvement District, and the Merchant City. The service began in August 2012 to address issues that members of the public, businesses and local residents were complaining about such as aggressive begging, noise nuisance (buskers), unauthorised charity collectors, drug misuse/dealing activities, vandalism, rough sleeping and general antisocial behaviour. These are all issues that have a significant negative impact on people’s levels of feeling safe. Alongside this, they also provide an ambassador role for tourists, visitors and residents of Glasgow, providing a point of contact and helping with information or assistance.